The goal of my breeding on Austrailian cattle dogs is to breed dogs for what they are bred to do! In other words I concentrate on that the dog has a herding instinct, if it is responsive and has the energi to concentrate on what it is doing. At the same time I only breed on healthy dogs. Because a unhealthy dog can´t do the same kind of work. I always x-ray hips and elbows. When I choose a dog I look for a well built dog that wants to please his owner and likes to work, they dont have to be obedience champions to give champions! I want it all and I think as a puppy buyer you should want it all! The dog has to provide the breed in some way! The goal is always to find the perfect balance between beauty and brains! When I sell a puppy I wan't the owner to work with the dog in some way or the other, whether it will be agility, hurding, IPO, obedience, freestyle or tracking dosn't matter. 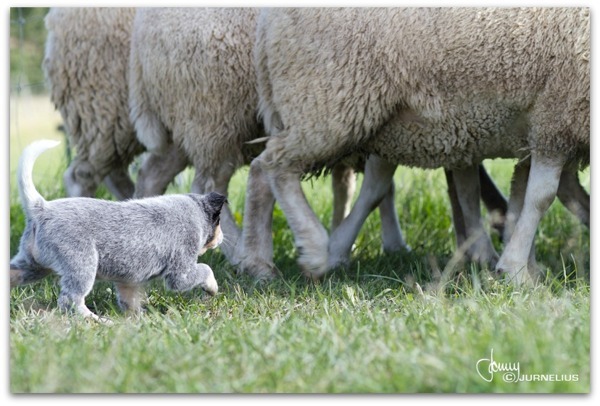 I belive that the herding instinct gives us the great all-round dog that the cattle dog is! I do not mean that you have to be a pro on hurding, just that you have an intrest for what this breed is meant to do! Before the puppies leave for their new homes they will be temperament tested, tested on stock, BAER tested, vaccinated, dewormed and microchipped. If we have a PRA A and B combination the puppies will be tested to see which they are. No puppy will be affected with PRA. Puppies will be matched to owners once tests have been done and breeder makes their puppy choise. Preference will be given to working & performance homes. Another thing that is important is that ALL of my buyers x-ray hips and elbows and also do a character test (MH, KORNING- if sold in Sweden). This helps me to evaluate my breeding for the better! Kennel camp is held once a year in the form of training in various disciplines and invitations from different instructors. At the same time I hope that this helps to create a good relationship with my puppy buyers. As with dogs from other working breeds, the Australian Cattle Dog has a high level of energy, a quick intelligence, and an independent streak. It responds well to structured training, particularly when the training is interesting and challenging. It is not aggressive, but forms a strong attachment with its owners and can be protective of them and their possessions, and it was bred to bite. It is easy to groom and maintain, requiring little more than a brushing during the shedding period. The most common health problems are deafness and progressive blindness (both hereditary conditions) and accidental injury; otherwise, it is a robust breed with a lifespan of 12 to 14 years. 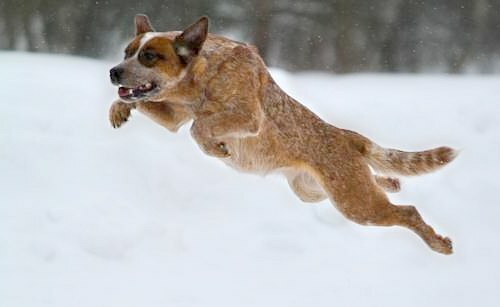 Australian Cattle Dogs now participate in a range of activities beyond the herding they were bred to do, including competing with their owners in sporting events and working as assistance dogs. The Australian Cattle Dog is a sturdy, compact dog that gives the impression of agility and strength. It has a broad skull that flattens to a definite stop between the eyes, with muscular cheeks and a medium-length, deep, powerful muzzle. The ears are pricked, small to medium in size and set wide apart, with a covering of hair on the inside. The eyes are oval and dark, with an alert, keen expression. The neck and shoulders are strong and muscular; the forelegs are straight and parallel; and the feet round and arched, with small, sturdy toes and nails. The female Australian Cattle Dog measures approximately 43–48 centimetres (17–19 in) at the withers, and the male measures about 46–51 centimetres (18–20 in) at the withers. The dog should be longer than tall, that is, the length of the body from breast bone to buttocks is greater than the height at the withers, in a ratio of 10 to 9. An Australian Cattle Dog in good condition weighs around 20–28 kilograms (44–62 lb). Black mask and tan markings on a blue dog- Working Mates Another Dewil "Junior"
There are two accepted coat colours: red or blue, though the miscolours of chocolate and cream do occur. Blue dogs can be blue, blue mottled, or blue speckled with or without black, tan, or white markings. Red dogs are evenly speckled with solid red markings. Both red dogs and blue dogs are born white (except for any solid coloured body or face markings) and the red or black hairs grow in as they mature. The distinctive adult colouration is the result of black or red hairs closely interspersed through a predominantly white coat. This is not merle colouration (a speckled effect that has associated health issues), but rather the result of the ticking gene. A number of breeds show ticking, which is the presence of colour through white areas, though the overall effect depends on other genes that will modify the size, shape and density of the ticking. 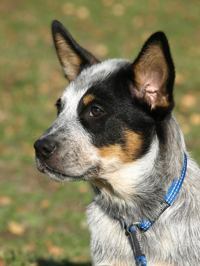 In addition to the primary colouration, an Australian Cattle Dog displays some patches of solid or near-solid colour. In both red and blue dogs, the most common are masks over one or both eyes, a white tip to the tail, a solid spot at the base of the tail, and sometimes solid spots on the body, though these are not desirable in dogs bred for conformation shows. Blue dogs can have tan midway up the legs and extending up the front to breast and throat, with tan on jaws, and tan eyebrows. Both colour forms can have a white 'star' on the forehead called the 'Bentley Mark' after a legendary dog owned by Tom Bentley. 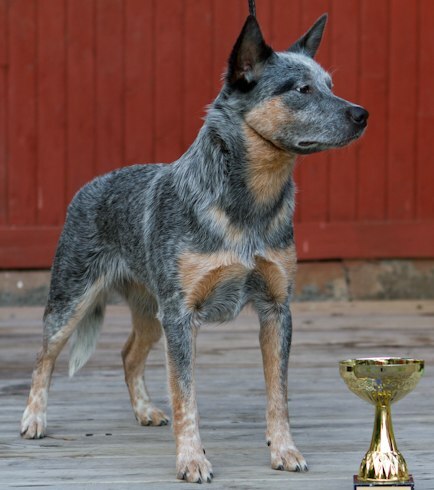 Common miscolours in the Australian Cattle Dog are black hairs in a red-coated dog, including the extreme of a black saddle on a red dog, and extensive tan on the face and body on a blue dog, called creeping tan. 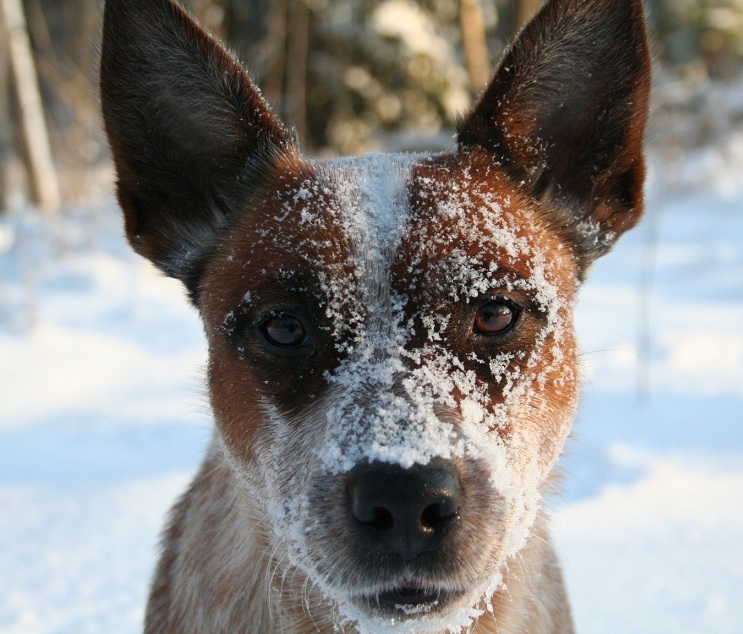 The Cattle Dog has a double coat—the short, straight outer guard hairs are protective in nature, keeping the elements from the dog's skin while the undercoat is short, fine and dense. The mask consists of a black patch over one or both eyes (for the blue coat colour) or a red patch over one or both eyes (for the red coat colour). Depending on whether one or both eyes have a patch, these are called, respectively, 'single' (or 'half') mask and 'double' (or 'full') mask. Dogs without a mask are called 'plain-faced'. Any of these are correct according to the breed standard. In conformation shows, even markings are preferred over uneven markings. In the US, tails are sometimes docked on working stock. The tail is not docked in Australia, and serves a useful purpose in increasing agility and the ability to turn quickly. The Australian Cattle Dog is a breed distinct from the Australian Stumpy Tail Cattle Dog, a square-bodied dog born with a naturally 'bobbed' tail. The Stumpy Tail resembles the Australian Cattle Dog, but has a taller, leaner conformation. It occasionally has a natural long thin tail, but most are born without tails. An ACD should have a alert expression. 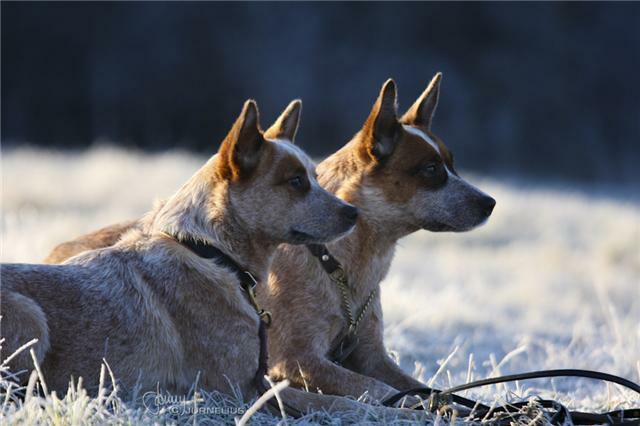 Like many working dogs, the Australian Cattle Dog has high energy levels and an active mind. The breed ranks 10th in Stanley Coren's The Intelligence of Dogs, rated as one of the most intelligent dogs ranked by obedience command trainability. The Cattle Dog needs plenty of exercise, companionship and a job to do, so a non-working dog might participate in dog sports, learning tricks, or other activities that engage its body and mind. When on home ground, the Australian Cattle Dog is a happy, affectionate, and playful pet. However, it is reserved with people it does not know and naturally cautious in new situations. It´s attitude to strangers makes it an excellent guard dog when trained for this task, however it can be socialised to become accustomed to a variety of people from an early age as a family pet. By the time puppies are weaned, they should have learned that the company of people is pleasurable, and that responding to cues from a person is rewarding. The bond that this breed can create with its owner is strong and will leave the dog feeling protective towards the owner, typically resulting in the dog's never being too far from the owner's side. Aggression in an Australian Cattle Dog is more likely to be directed at strangers than owners or other dogs, though it will bite if treated harshly. While an Australian Cattle Dog generally works silently, it will bark in alarm or to attract attention. It has a distinctive intense, high-pitched bark. Barking can be a sign of boredom or frustration; however, research has shown that pet dogs increase their vocalisation when raised in a noisy environment. It responds well to familiar dogs. However, when multiple dogs are present, establishing a pecking order can trigger aggression. It is not a breed that lives in a pack with other dogs. The Australian Cattle Dog demands a high level of physical activity. Like many other herding dog breeds, the Cattle Dog has an active and fertile mind and if it is not given jobs to do it will find its own activities – which might not please the owner. It will appreciate a walk around the neighbourhood, but it needs structured activities that engage and challenge it, and regular interaction with its owner. While individual dogs have their own personalities and abilities, as a breed the Australian Cattle Dog is suited to any activity that calls for athleticism, intelligence, and endurance. Kennel club-sponsored herding trials with a range of events suit the driving abilities of the Cattle Dog and other upright breeds, while sheepdog trials are more suited to the 'eye' breeds such as the Border Collie and Australian Kelpie. Herding instincts and trainability are measured at non-competitive herding tests, and basic commands are sometimes taught through herding games, where rules such as 'stay', 'get it' and 'that'll do' are applied to fetching a ball or chasing a yard broom. The Australian Cattle Dog was developed for its ability to encourage reluctant cattle to travel long distances, and may be the best breed in the world for this work. However, some working dog trainers have expressed concern that dogs bred for the show ring are increasingly too short in the legs and too stocky in the body to undertake the work for which they were originally bred. 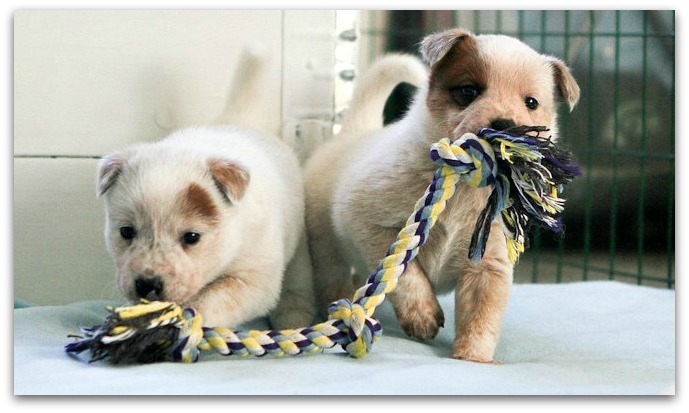 Among the most popular activities for an Australian Cattle Dog is dog agility. It is ideally suited for navigating obstacle courses, since as a herding dog it is reactive to the handler's body language and willing to work accurately at a distance from the handler. Agility has been used by Cattle Dog owners to instil confidence in their dogs, and enhance their performance in training and competition. The Australian Cattle Dog can be put to work in a number of ways. Cattle Dogs are service dogs for people with a disability or are therapy dogs, some work for customs agencies in drug detection, some as police dogs, and others herd pest animals, such as geese, for city or state agencies. Cattle Dogs have more injuries than illnesses. The Australian Cattle Dog is one of the dog breeds affected by progressive retinal atrophy. It has the most common form, Progressive Rod/Cone Degeneration (PRCD), a condition that causes the rods and cones in the retina of the eye to deteriorate later in life, resulting in blindness. PRCD is an autosomal recessive trait and a dog can be a carrier of the affected gene without developing the condition. Hip dysplasia is not common in the breed, although it occurs sufficiently often for many breeders to have their breeding stock tested. 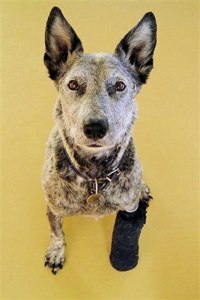 The Cattle Dog has a number of inherited conditions, but most of these are not common. Hereditary polioencephalomyelopathy of the Australian Cattle Dog is a very rare condition caused by an inherited biochemical defect. 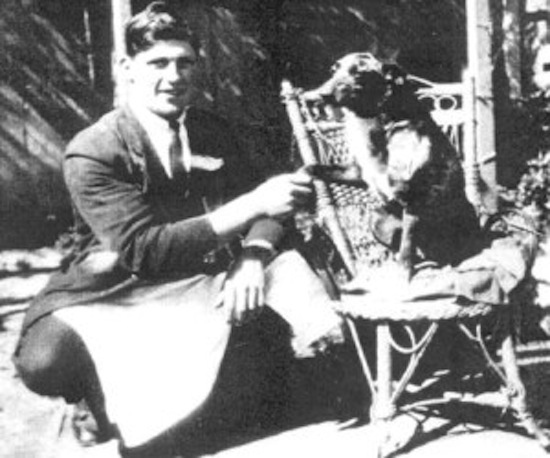 Dogs identified with the condition were completely paralysed within their first year. Based on a sample of 69 still-living dogs, the most common health issues noted by owners were musculoskeletal (spondylosis, elbow dysplasia, and arthritis) and reproductive (pyometra, infertility, and false pregnancy), and blindness. A study of dogs diagnosed at Veterinary Colleges in the US and Canada over a thirty-year period described fractures, lameness and cruciate ligament tears as the most common conditions in the Australian Cattle Dogs treated.